Diego Maradona has spoken in Ole (Spanish link), mainly about Argentina's loss to Brazil in the Copa America final. He is disappointed that Argentina have once again failed at the crucial point in an international tournament, remarking that they had no "physical nor psychic answers to Brazil". He feels that Argentina need to look at the way European teams like Italy, Germany and Spain play and maybe incorporate some of that into their play if they are to be succesful in future tournaments. On the retirement of Roberto Ayala from international football, Maradona thinks that he was a great player and that no blame should be attested to him for the Copa America final defeat. He also seems to hint that Ayala felt a lack of support from national team boss Alfio Basile, which is why he has decided to retire. Maradona states that Juan Riquelme had a great tournament, and that he wishes for Riquelme to stay with Boca Juniors next season, despite various offers from European sides. He remarks of Lionel Messi, "whenever he touched the ball, it felt that he was going to do something important" and goes on to describe him as a "phenomenon" for whom the sky is the limit. 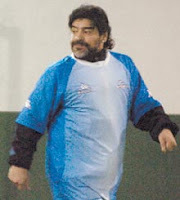 Maradona is also proud that Messi carries round a signed picture of him in his wallet and idolises him. When asked who else in the Argentina team impressed him during the Copa America, he singles out Javier Mascherano, saying that "Mascherano is always where the ball is" and likening him to Matias Almeyda. He is then asked what he thought of Ever Banega's performances during the U-20 World Cup, Maradona responds that he was very impressed with the way Banega played. He says that he always seems to know what to do in every situation, although he does perhaps need to calm down a bit. Finally, when asked who he would support out of Barcelona and Real Madrid next season, he responded that he couldn't seperate them, as he is fans of both Javier Saviola and Fernando Gago at Real and Lionel Messi at Barcelona. He feels Barcelona will prehaps be a little stronger due to the purchase of Thierry Henry.